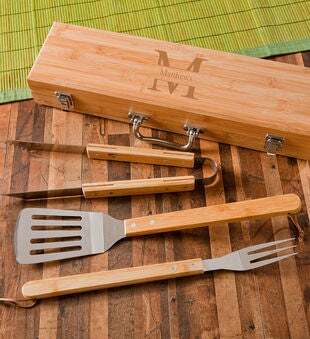 This Monogrammed BBQ Grilling Set with Bamboo Case is the perfect gift for anyone who loves to entertain at the grill or even as a Father's Day or wedding party gift. The grilling set is lightweight, has great transportation for your spatula, fork, and tongs, and is kept in top-notch condition with protection from the high-quality bamboo case. Each case is equipped with securing latches and a rugged handle.